Hello Chicago. If you ventured out to any of this year’s 26th Annual Comedy Festival, you may have seen Ian Abramson performing, either as the host of the delightful 7 Minutes In Purgatory, or perhaps opening for Kyle Kinane. 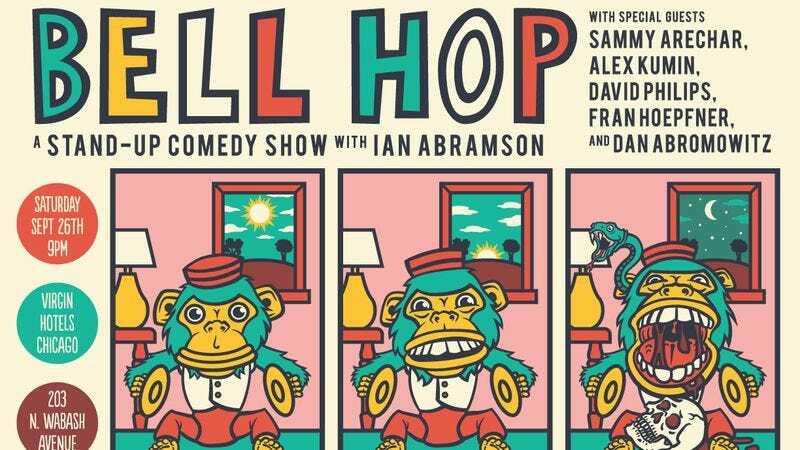 Abramson and his 7 Minutes co-creator Matt Byrne have come up with a new monthly live comedy show, Bell Hop, which debuted at the Virgin Hotel Chicago this summer. Now they’ve fired up a third installment, featuring a ton of great Chicago talent, including some writers from our sister publication, Clickhole. There will be stand-up from Sammy Arechar, Alex Kumin, and David Philips, a reading from Clickhole writer Fran Hoepfner, a solo sketch from Clickhole writer Dan Abromowitz, a secret surprise headliner who we’re not allowed to mention by name but you’ve seen on Comedy Central, and more. The show is free, too, but space is limited: Get to the Virgin early-ish, and tell them you’re looking for the 25th floor. It will be fun.